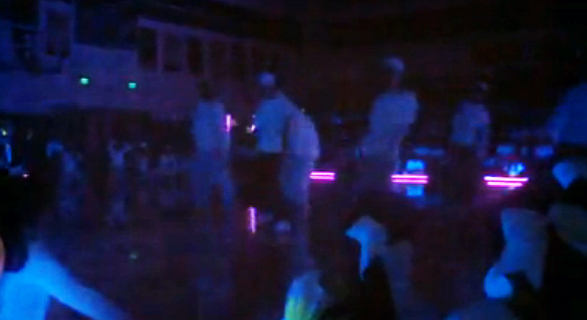 My school had a blackout assembly the other day, where everybody wore white and they put up black lights all over the auditorium. It was really fun, I was super excited because I love black lights, I even have one in my bedroom! LOVE this look! I've been using lash glue for my loose glitters and pigments & it works great, my glitter sticks allllll day. Give it a try! OMFG THIS IS SO COOL! I used to be obsessed with black lights too when I was a teen... I had 2 of them in my bedroom. I even had glow in the dark paint on my walls, lol. I wish my high school was as awesome as yours is. The most extravagant thing we ever had were pep rallys, and those sucked as well haha. I think MUFE has a powder you can mix into your makeup to make it all glow in the dark! Anyway, awesome look! wow! This looks is so pretty and cool! That's the neatest thing ever! I love it! I got the rhinestones from Michael's craft store, they were with the jewelry stuff. A long time ago I bought some rhinestone nail decals from the drugstore and those worked great too! Stunning! The glitter is a great colour and I love that it glows in the dark. Love the black crease with green, too. wow how cool is this!? that colour is to die for. I wish we had a glow in the dark assembly! I know! I want it so bad!